Aquafeel Girls Racing i-NOV Kneesuit in a profesional looking and stylish blue and black is perfect for your daughters club competitions! 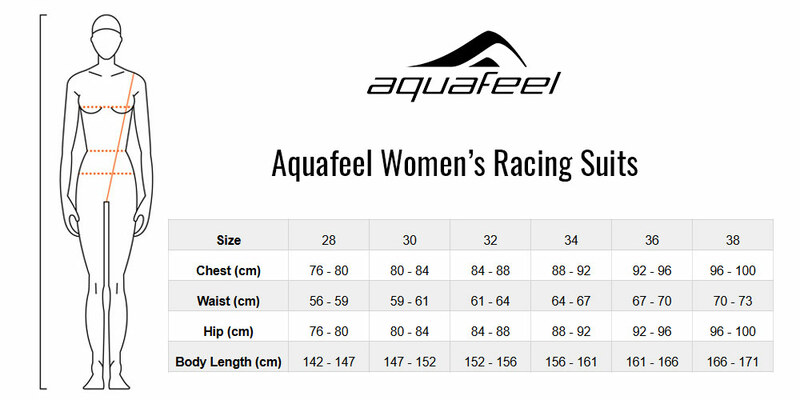 It has FINA approval and is designed specifically for young females looking for a racing kneesuit. With swimwear it's all about the fit and the confidence the suit generates. The i-NOV range has been designed with this in mind. The classic, yet technologically advanced design of the range combine to make this a real 'stand out' option. This i-NOV range has been designed to withstand some of the toughest conditions and the constant exposure to chlorine, which impairs the elasticity and the return force of standard Lycra suits. Large number of fantastic features, read on below! FINA approved Junior Kneesuit designed for racing. With swimwear it's all about the fit and the confidence the suit generates. The i-NOV range is made with Xtra Life Lycra ® fabric, the swimmer benefit from a perfect fit and added, noticeable durability. The multi-directional fabric constantly follows the movement of the body and feels like a second skin. The i-NOV suits offer great freedom of movement combined with constant muscle compression. Ultra flat 4-needle-Flatlock stitched seams - these fix the single cutting parts of the suits with extraordinary strength whilst maintaining great wearing comfort and durability. New Xtra Life Lycra ® - swimmers will benefit from a perfect fit and great performance for much longer than other, conventional fabrics. Crossback design - gives freedom for shoulder movement whilst adding to the suits strength.